March 26th 2016 - The city of Alvin, located about 30 miles south of Houston on State Highway 6, is best known as the hometown of Baseball Hall of Famer Nolan Ryan. But here at the TGA we like to think that there are two notable sports icons that hail from Alvin. In addition to Ryan, the other star is Jim Brown, now of Dallas, a longtime supporter of amateur golf and newly elected TGA President. Brown grew up with Ryan and the two even played baseball together. In the archives of the Alvin Sun-Advertiser there is a picture of the 1957 Little League All-Star team, featuring Brown as the starting pitcher and Ryan the speedy second baseman. It is perhaps the first and last time the future flamethrower ever got bumped from the mound. Although he enjoyed playing in Little League, Brown opted to devote his full attention to golf balls instead of fastballs. In the ensuring years he and his dad, who introduced him to the game when Brown was 9, made countless loops around Alvin Golf and Country Club, a quaint nine-holer billed as “The Friendliest Course in Texas.” Emulating the work ethic of his golf idol, Arnold Palmer, Brown diligently worked on his game and matured into a gritty competitor, starring on the Alvin High Yellowjackets golf team and earning a scholarship to play for SMU. Though a comparatively small school, SMU always fielded a pretty good team. But, being in the then-Southwest Conference meant week after week the Mustangs found themselves up against some big name programs like A&M, UT and perennial powerhouse University of Houston, which seemingly had an endless supply of future PGA Tour players on its roster. It was enough to convince Brown that professional golf was not in the cards. So instead he focused on his education, completing his undergraduate degree in 1967 and his Juris Doctorate in 1972. His time at SMU was so enjoyable that Brown decided to settle in Dallas, launch his law career and raise a family. He and wife Camille – they’ve been married for 46 years – have two children and four grandchildren. 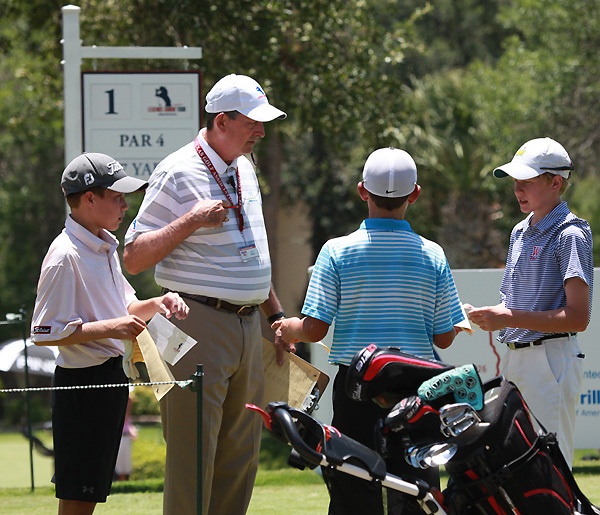 A longtime member of Dallas Athletic Club, Brown’s passion for the game is as strong as ever and plays whenever his busy volunteer schedule allows. We had a chance to talk with Brown about his new role and his thoughts on the game in general. [Q] What excites you about being president of the TGA? [A] I am particularly excited to be a small part of a great organization dedicated to improving the game of golf in Texas for all ages of men, women and children. [Q] I know it's very early in your administration, but have you thought about long-term goals for the TGA? [A] In the long-term, I want us to continue to reach out to all of our members; not just those that compete at very high levels. Our Medalist Series, Texas Shamble, TGA Play Days, Play 9 and the travel opportunities are all examples of how we have already begun to do this. [Q] What's your best reason for why you play golf? [A] Enjoyment has always been THE reason that I play. When I entered law school, I basically quit golf for about 25 years. One Saturday, a good friend invited three of us to join him at Stevens Park. Playing that morning was like an unrequited love affair. All I wanted to do after that round was to play more golf. The early Saturday morning rounds became something I really looked forward to. After several years, I was able to justify joining a country club (Dallas Athletic Club), so that I could play whenever my job would allow. [Q] Has your golf game been affected since coming onto the TGA Executive Committee? [A] Yes, my handicap is rising! However, I have never been happier doing anything in my life. I am very blessed to have a very understanding wife, Camille, and a wonderful and supporting family. [Q] What’s the hardest course you’ve ever played? [A] The Ocean Course at Kiawah Island. I played it one time on a very windy, rainy day. The conditions were so bad that they cut my green fee in half since I was the only person to play that day. The holes downwind didn't seem so bad, but those going into the wind were all but impossible! It was rough, but I loved it! [Q] What’s the oldest club in your bag? [A] My metal 3-wood is the original TaylorMade Burner with the original Burner Bubble shaft. It is 20+ years old and I cannot find a replacement that I can hit any better. [Q] What do you like to do in your free time, if indeed there is any? [A] Needless to say, my faith and time with my family are first and foremost. I also love playing golf with my brother and friends at Dallas Athletic Club. But, I love refereeing! Rob Addington has assembled a staff second to none. I have become very close friends with many of my fellow volunteer referees. I look forward to the days on a golf course when I get to spend time with each of them, along with the wonderful TGA Members I get to meet. This is something I hope to be doing years after my tenure as President is over.